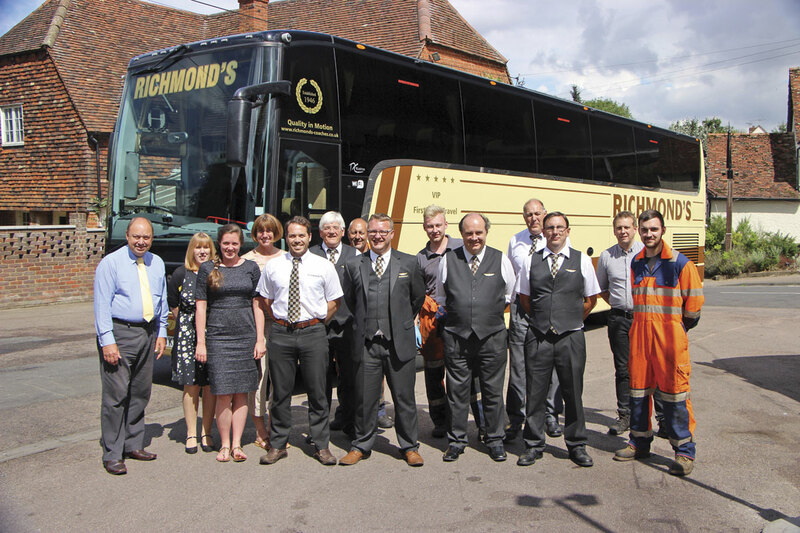 Richmond’s Coaches of Barley in Hertfordshire is a family business in every sense of the word. 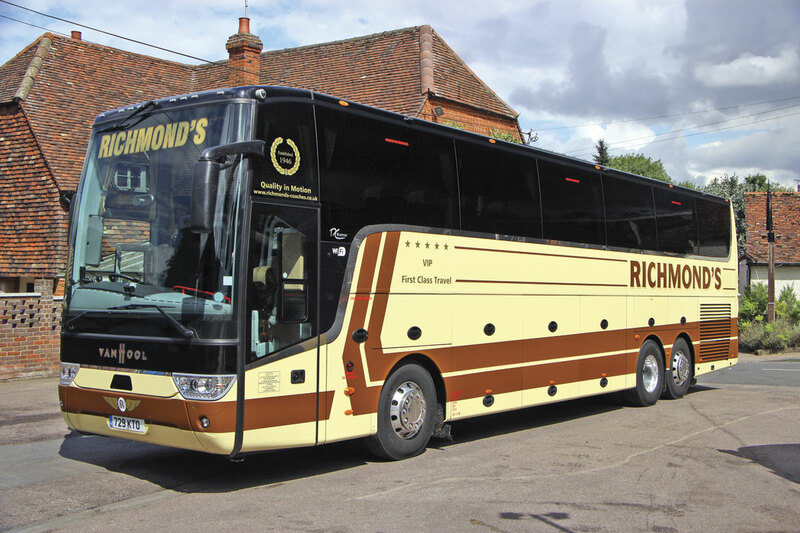 Not only have three generations of the Richmond family run it since former RAF Wellington pilot, Harold Victor Richmond (known as HVR), acquired the operations, fleet and premises of A Livermore in July 1946, but generations of other families have worked for them. Among today’s staff of around 60 there are multiple members of many other families including: father and son, Pat and Jack in the workshops: father and son, Rick and Craig in the management team; mother in law and daughter in law, Audrey and Lisa in the office; father and son drivers, Jim and Alan; and father and son, driver and mechanic, David and Scott, in addition to which there have been many other father, brother, son and cousin combinations in the past. In this their 70th anniversary year, the third generation is at the helm. 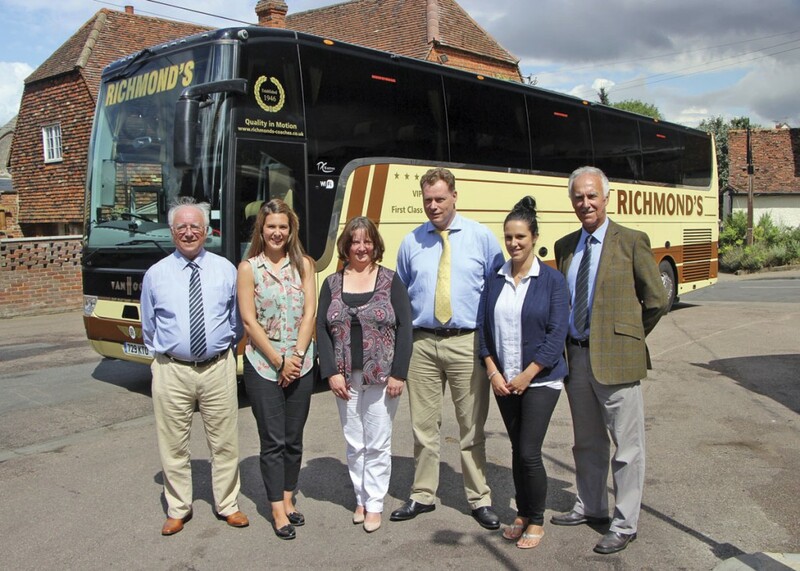 Former MD, David Richmond and Engineering Director, Michael Richmond now take more of a back seat, working one and two days a week respectively, while David’s son, Andrew has become MD, daughter Diane is the Tours Manager and Michael’s daughter Emily is the accountant with her sister, Natalie Hyndman, working three days a week handling quotations and bookings. Andrew told me something about the company, what it does and how it operates, as well as passing on some of his thoughts about the industry when I met him at Barley recently. Andrew started his career working for Armchair Passenger Transport under Simon Newman as a student on placement in 1989, subsequently joining them. Apart from being laid off for a short period in 1991 as a result of the Gulf War, he stayed until 1997 when he joined the family firm, initially working alongside his father and uncle along with the rest of the office team. It is Andrew’s philosophy that managers manage, the maintenance team maintains, drivers drive and cleaners clean, and to this end a full time team of five cleaners is employed working a four days on, two days off roster system so that there is always a cleaner on the premises from 05.00 to 22.00 daily. Despite this, I noticed a lot of drivers doing little cleaning jobs on their coaches. 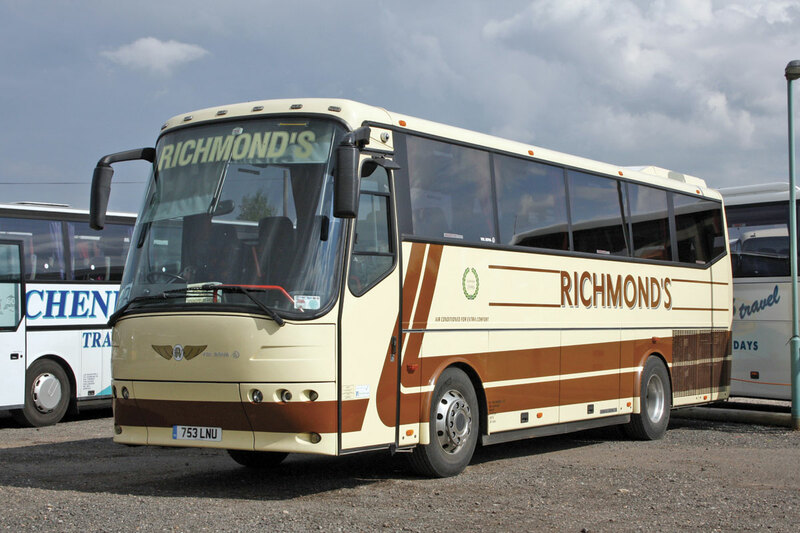 It explains why you never see a badly presented Richmond’s coach and rarely see a dirty one unless the weather makes it unavoidable. The cream and brown livery dates back to the time of Livermore’s, although the brown they used was apparently a little darker, and for a while in the 1960s and 1970s an all cream scheme was used. The winged emblem harks back to HVR’s RAF days with his initials added in the centre. There is a maintenance team of four full timers. 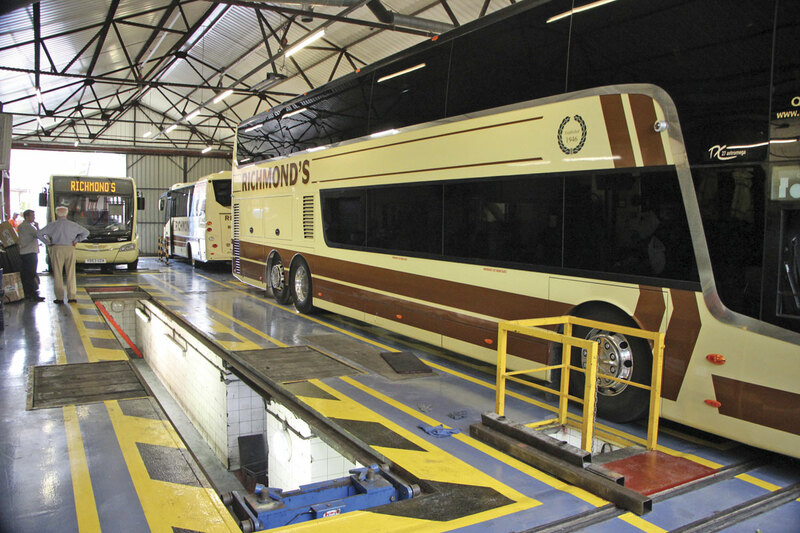 They are kept busy in the well equipped four bay workshops, with their immaculately painted floors. These have a variety of stores and offices off to one side in what had originally been a stable block. There are no apprentices at the moment, though there have been in the past and both Scott and Patrick undertook their apprenticeships in Barley. Staff turnover is low and many individuals have been with the company for a very long time. Jim has been with Richmond’s since 1977 and Rick since 1978. The longest serving of the cleaning staff, David has been in the role since 1984. The Richmond’s Coaches workload is infinitely varied. They avoid stag and hen trips like the plague and don’t tend to do football and rugby work but apart from that they do pretty much anything and everything with all ages and nationalities catered for. 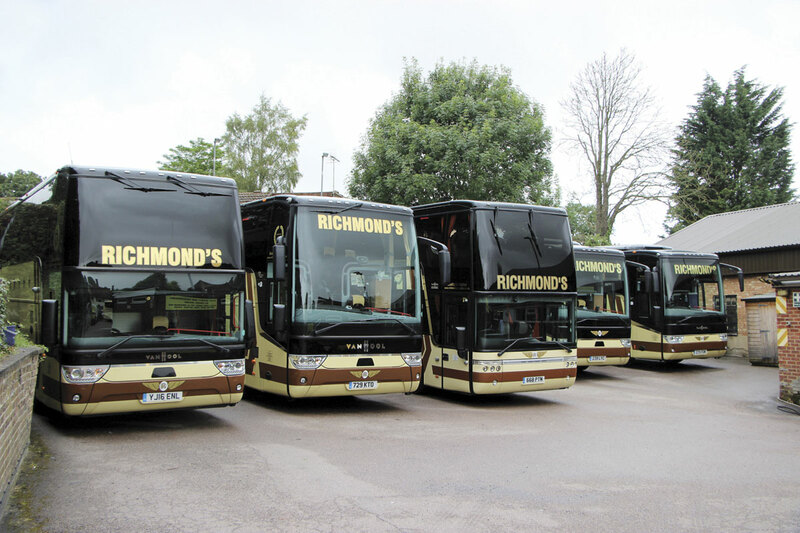 The private hire side includes UK and continental touring, including a small amount for a tour company with which there is a longstanding relationship, cruise ship transfers, rail replacement, conferences and corporate work. As well as this there is a lot of niche private hire for clients across a wide area and regular work for inbound and outbound groups. Both day excursion and British and Continental tour programmes are operated in their own name. HVR had run a tour programme back in 1946 though this was discontinued during the 1980s along with the day excursions. 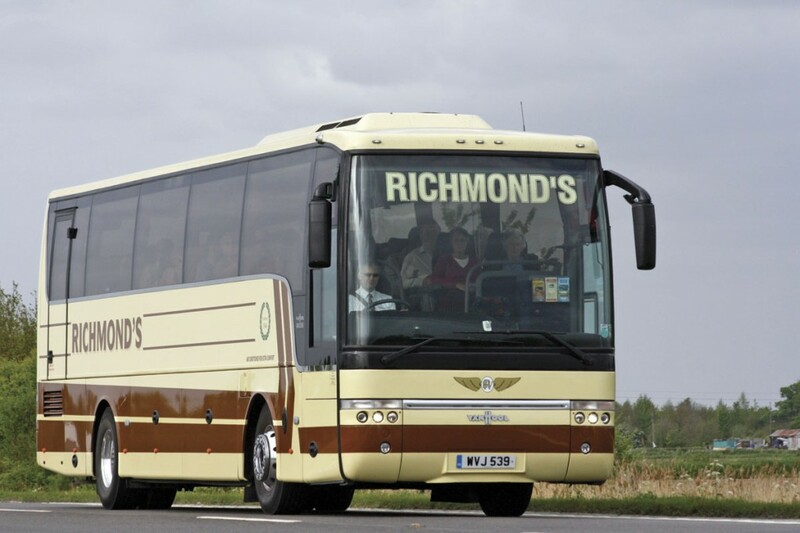 What saw excursions reintroduced was the acquisition of the fleet of Smiths of Buntingford in February 1994 which had its own programme and this was followed in 2003 by the reintroduction of tours, around 30 of which will operate this year. 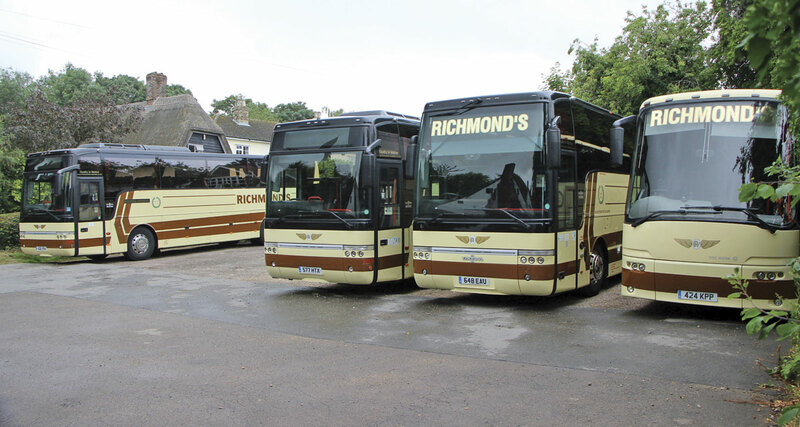 The excursion side is now quite extensive, tying up one or two coaches for the best part of nine months of the year. Very few are cancelled though some might be run with a smaller coach such as one of the TX11s and at the other end some departures need two coaches or the use of a double decker. Looking back, though there has always been a degree of variety in the fleet, at any given time one brand dominated. Initially it was Bedford but in 1961 a batch of three Duple Ford 570Es arrived and the marque was then favoured, particularly once the engines gained turbochargers and ‘would overtake any Bedford’ though they needed some notice to stop. From 1982 Volvos with Plaxton and later Van Hool coachwork took over, accompanied by Mercedes-Benz and Toyota minis. Four short Dennis Javelins with Berkhof Axial bodies were bought between 1997 and 2001 and from 2003 Bova/VDL Futura Classics became the norm, accompanied by a pair of Van Hool Alizees in 2005. More Van Hool bodied Volvos were purchased, and though there have been a couple of subsequent secondhand Volvo acquisitions, the last brand new example, a B12BT Van Hool arrived in March 2008. At the same time a pair of DAF powered Van Hool T9 Astron integrals were bought and except for three more Futuras, all new full sized purchases since then have been DAF engined Van Hool integrals. This year’s three coach acquisitions are all three-axle Van Hool TX integrals purchased through Arriva. 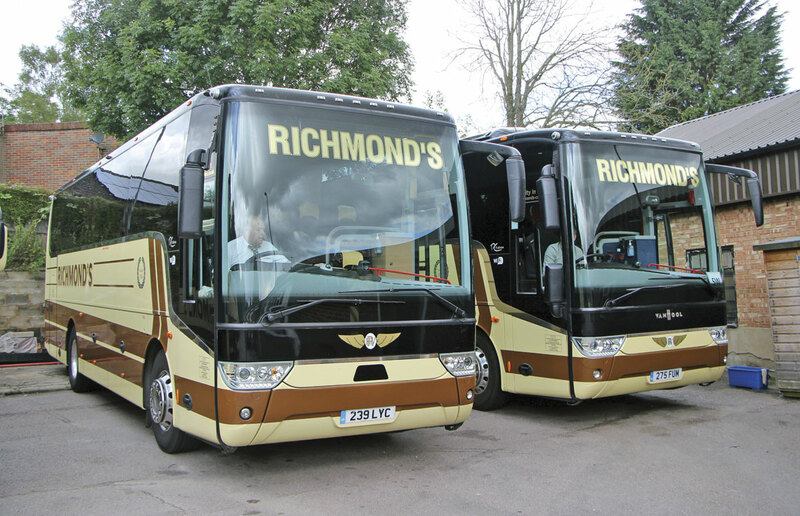 Two are 13m 53-seat TX16 Astrons with toilets and the third, a TX18 Altano, marks a departure for Richmond’s in having 61 seats. Though it has less seating capacity than a double deck Astromega, it has a lot more luggage room and is well suited for tasks such as cruise feeders. A feature of the fleet is its use of double deck coaches with five currently operated. 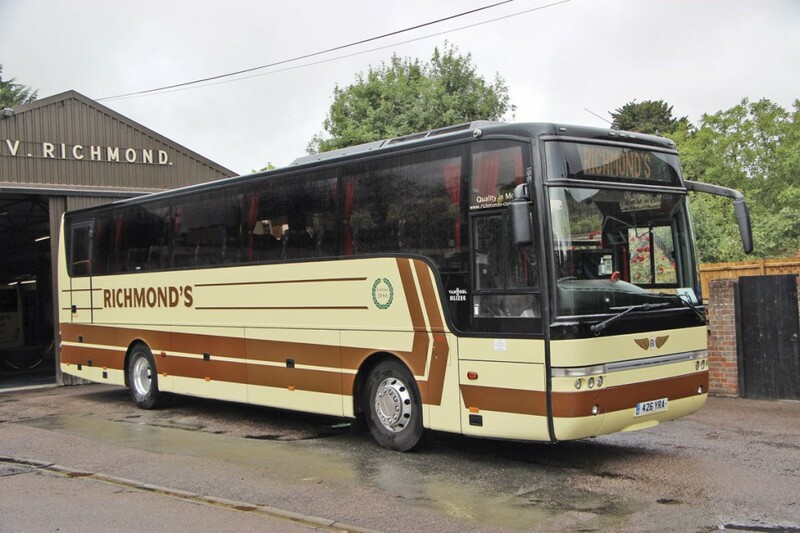 The first was a pre-owned 2006 B12B Astrobel 79 seater purchased in 2009, followed by another similar used acquisition in 2011 after which new TDX27 83 seaters were bought in 2013 and 2015 and a former Beestons TDX25 79 seater in December 2014. Operating double deckers is quite specialist, not to mention capital intensive. I asked Andrew what he thought was the secret to making them pay? Apart from saying ‘Get them hired out,’ he said it didn’t work only operating one; you needed a number so that you could cover any eventualities. 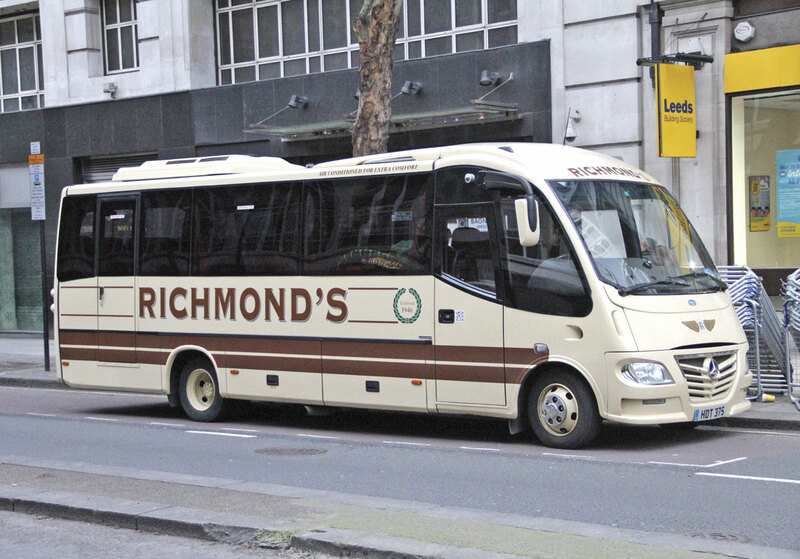 At Richmond’s they are used a lot on the excursion programme rather than allocating a second coach. 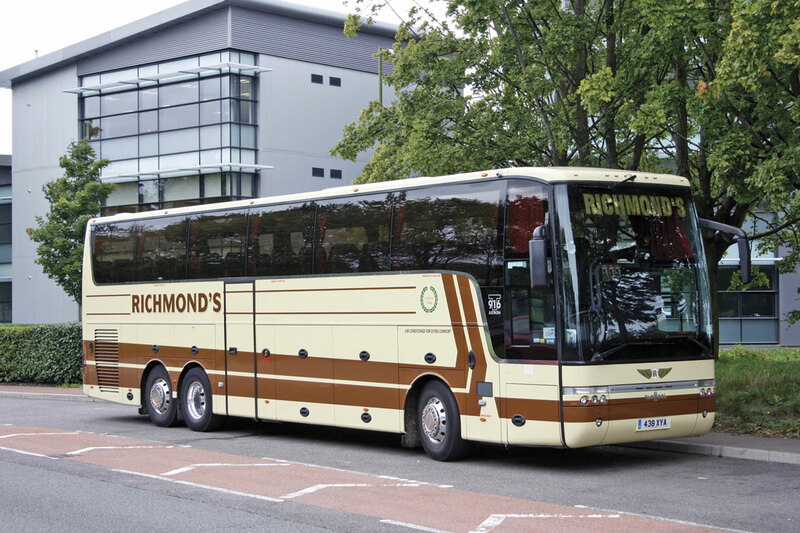 On private hire, the key to their success is people’s preparedness to pay a premium over the cost of a smaller coach because they don’t need to hire in two coaches to carry between 53 and 80 people. They are prepared to pay that premium because it still represents a discount on the cost of two coaches. ‘Ours offer good legroom and never fail to impress,’ said Andrew. When I asked whether trailers were ever used for additional luggage capacity, David replied by asking whether I had ever tried moving a loaded four wheel trailer? On the bus side, all six vehicles are Optare Solos of various types. Richmond’s’ first Solo was bought in 2000 and the latest are three Euro6 powered SRs purchased for Hertfordshire County Council’s 386 and 90/91 service between Bishops Stortford and Stevenage via Buntingford last year. Asked why Optare was the preferred supplier, Andrew said, ‘David Gabriel, with his can do, will do attitude, has single-handedly ensured we remain loyal to the brand. One day we rang him for advice and he came down and sorted the problem there and then. 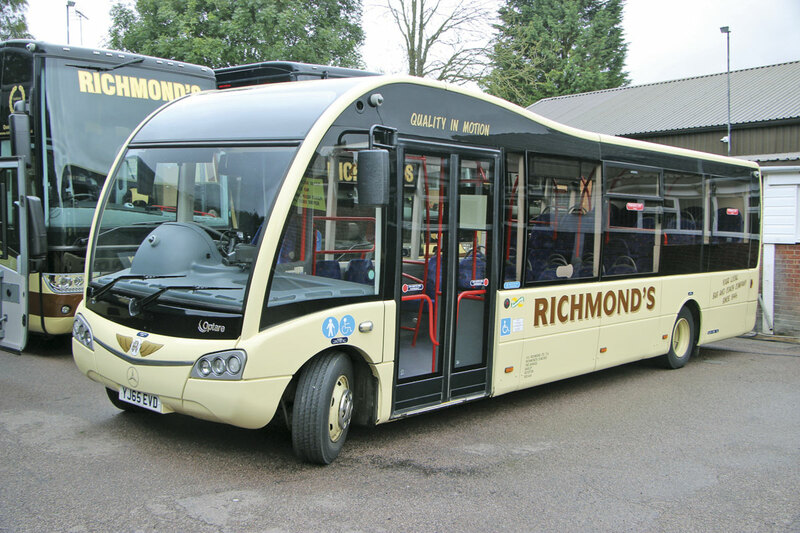 The vehicles are well engineered and reliable, the helpline is excellent, parts provision is good, the drivers and passengers like them and they are economical and robust.’ Apart from the new trio there is a 09-plate 21-seater on the HCC contracted Royston town service, a 2013 Euro5 SR on a bespoke station shuttle and a 2005 bus that acts as the spare. The bus driving team is predominantly a separate one, many of whom work a four day week to create flexibility, but there are drivers who like to do both bus and coach work. ‘We have had extremely good feedback and staff commendations for the route we have just taken over,’ said Andrew. The company works with other operators all over the country and enjoys good relationships. ‘If we can help someone, we will. We’re very close to Cambridge, South Mimms and Birchanger Green/Stansted, so if someone has a mechanical issue and needs passengers moving we try and help. We often have a spare driver allocated in the yard on standby for our own purposes so we’re worth a call,’ said Andrew. Based on his experience in the industry, Andrew believes there are a number of areas the Government could usefully look at to improve things for the industry and its employees. The most important change he’d like to see is to the driver licensing and DBS regulations. He believes the DBS (Disclosure and Barring Service) (formerly CRB) clearance should be part a person’s permission to drive a PCV, saying, ‘I don’t see why anyone who isn’t of good character should be allowed to drive a PCV. If you fail a DBS your licence should be automatically revoked.’ David added that having to undertake separate checks for different areas was wrong. His final concern related to the construction of cycle ways, and wasn’t as it has been for many, related to the disruption caused in creating them, but to ensure they are built in a manner which is sensible and doesn’t result in bikes merging with large vehicles at unexpected points. I haven’t gone too deeply into the previous history of the company because, apart from there not being room, the family commissioned an excellent book by Paul Carter for the 60th anniversary and anyone who wants to know more would be well advised to purchase a copy. Andrew assures me they have a number available at a cost of £15.00 each. And, though they were almost certainly scrapped decades ago, if you happen to know what happened to any of the three Bedford OBs that the company bought new, registered TMV948, GUR985 and SML958, Andrew would very much like to hear from you.